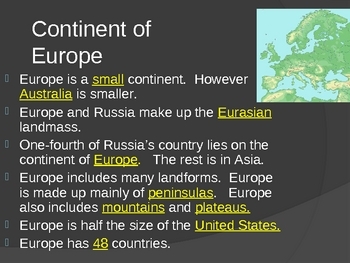 This PowerPoint has 101 slides that review Europe's culture, religions, languages, economies, governments, trade, environmental concerns, geography. 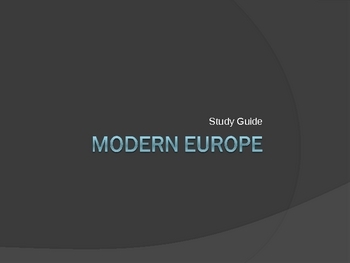 It goes along with the free Europe guided notes/ study guide- Modern Europe. 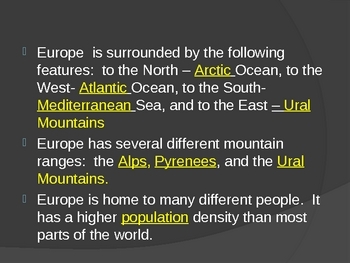 It includes excellent graphics, charts, tables, maps, and pictures to reinforce the key ideas. This is a complete review over all of the national social studies standards. This review should take about a week (at least) if you complete all of the activities that are in the presentation and have the students draw the thinking maps.